Today, half of the world’s population lives in urban settings. By 2050, it is estimated that up to three quarters will live in a city with 90% of this growth taking place in cities of lower-income countries often at risk of fragility. In line with these urbanisation trends, internal displacement has become increasingly urban. Significant efforts are being made to adapt humanitarian response accordingly, however many challenges still remain. For one thing, humanitarian action has often been guided by a “prejudice” directing efforts and responses towards supporting people in conflict zones, in remote crisis settings, in camps, and so on. It is only in recent years that important efforts have been initiated to develop better urban responses, yet the typical humanitarian response is still inadequate for IDPs living outside camps. Unverified assumptions – such as displaced people in urban settings face the same problems as the urban poor, – often form the basis of programmatic decision making and therefore significantly limit the effectiveness of humanitarian action in meeting IDPs’ needs. 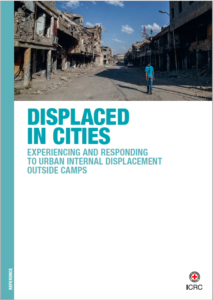 ICRC‘s report “Displaced in cities; Experiencing and responding to urban internal displacement outside camps” studies some of the key issues associated with the reality of urban displacement. Among others, it highlights that to properly address the specific challenges associated with urban displacement, it is first of all crucial to acknowledge that better responses must originate from better data and analysisinstead of unverified assumptions – this point was articulated by all panellists at the event.